I’ve been in a lot of critique groups, and am currently running one right now because I know the help it can provide and I love reading the work of my fellow writers. But sometimes, a good critique partner is hard to come by. The art of critiquing is one that has to be developed. I always encourage new writers to attend a meeting first to see how we provide feedback and see if it is a style they like. All groups and people give critique differently, I’m just now learning the different levels of feedback authors can look for. Just to name a few. One bad critique session can be so crushing it can turn a writer off showing their work for a while. So it is important to everyone in the group understands what they are there for and how to give the best feedback and also how to receive it. I get it. Hearing your baby isn’t perfect is hard, but here are a few key pieces of advice I’d like you to take to heart if you’re new to critiquing or new to receiving feedback. Not everyone is going to like your work. And that goes for critique partners as well. Yes, even good critique partners. It is so important to keep this in mind. People are drawn to certain genres and styles for a reason and we can’t help but let our bias seep in when we give a critique. All advice and feedback can be said with the best intention of improving the work, but if it doesn’t work it doesn’t work. When taking in feedback don’t strive to please everyone. Know when to apply feedback and when to brush it off. This will help you maintain sanity. This is a lesson I had to learn when showing my romance novel for critique. During one session a man gave very direct feedback that I didn’t know how to handle. It’s not his fault, he didn’t understand the genre and the audience I was writing for and he was giving the best feedback he could. But it still hurt, I had to tell myself he wasn’t my target audience and most of his notes would not improve my story because they were things that were simply not done in the genre. For people new to critique remember that you should not talk about how you would write the piece, but how the writer can make it better. Think about the person’s style, intention, and genre and how the writer can achieve the best product possible. Be aware of your own weaknesses. This goes for both the writer and the critique partner. like to ask what the writer is looking for in my feedback if they want me to point out plot holes, look at the big picture, or grammar. I’m great at looking at the product as a whole but if someone is looking for copy edits they should probably ask someone else. As the writer, I try to let everyone know what I perceive to be the biggest weaknesses of the piece. My grammar skills are always the top of the list, but sometimes I know I need to work on a wobbly middle or character motivation. Identifying the weaknesses in our pieces will ultimately make us better writers by targeting our own self-edits but it will make us better Critique Partners as well. Again, some of us need to develop those eagle eyes for editing, so knowing what we’re looking for helps narrow down the edit of a 300 page story. You can always do better! I can’t express enough the importance of finding someone who writes the same genre as you or who enthusiastically reads it. Because they are your target audience. A writer would likely know the same craft nuances you have to consider for your genre and a reader would hopefully tell you the book hit all the right spots. These are some of the most valuable criqitues. Not saying someone outside of the genre can’t provide good notes on editings, pacing, and voice But there might be a bigger gap of understanding between the two of you. 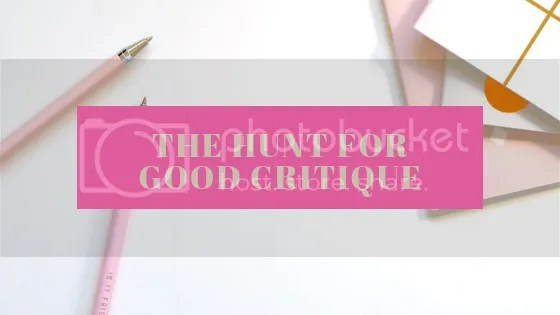 Finding someone to provide good critique is hard but not impossible. The internet it was a great place and it has become considerably easier. Try the #CPmatch on twitter. Megan Lally organized the Twitter Hashtag and has a great description of it over on her blog! Or just let the twitter writing community know that you’re looking for critique along with a brief description of your novel.